A joint military drill sponsored by the United States with several Mideast nations that did not include Israel has suddenly been canceled. A massive joint military drill sponsored by the United States with several Mideast nations - that did not include Israel - has suddenly been canceled. No reason was given for the abrupt about-face. Over 12,000 soldiers were taking part in the war games, representing 19 countries, including Bahrain, Egypt, Iraq, Jordan, Saudi Arabia, Lebanon, Pakistan, Qatar, Britain, France, Italy, Spain and Australia. Of those, 6,500 soldiers were from the United States, and 3,500 were from Jordan. 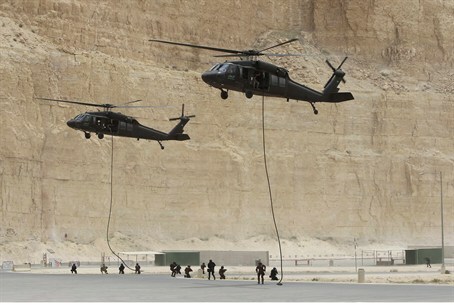 The drill included scenarios in which soldiers were directed to free captives held by terrorists. It also focused on training Jordanian and Saudi service personnel in how to treat refugees, and on naval interception of smuggling vessels, according to Maj.-Gen. Ken Tovo, U.S. Commander-General of Special Operations. But, although it began on time and was set to end later in the week, the exercise was instead halted on Monday - three days early. One possible explanation may have to do with Syrian irritation over the drill. Syrian newspapers claimed the “Exercise Eager Lion 12” was named after the Arabic surname of Syrian President Bashar al-Assad as a message that foreign forces are knocking at his door. Assad means “lion” in Arabic. U.S. officials said that preparations for the event, and the process of choosing a name for the exercise began two years ago – prior to the Arab Spring uprising that sparked the current, bloody Syrian civil war. Thus far, at least 110,000 Syrian refugees have crossed the Jordanian border to find safety in the Hashemite Kingdom. Even so, Tovo told a news conference in Amman during the drill that the war games were “not connected to any real-world event.” Military commanders took care to keep the exercises located in southern Jordan and away from the Syrian border in the north.